German Ambassador to Seoul Hans-Ulrich Seidt (center) poses with exporters of German wine at his residence in Seoul's Seongbuk-dong on May 26, 2012. Some 30 different kinds of the eight wine producers were presented to the local wine importers and wine connoisseurs at the residence of Germany envoy in Seoul's Seongbuk-dong on May 26, 2012. The German Ambassador to Seoul Hans-Ulrich Seidt gave a congratulatory speech in front of the gathering for the special wine event which began at 2 p.m. on the day. "It is an honor to have experts like you in this great weather, and particularly I thank wine producers from Germany for this opportunity." he remarked. The German envoy added that the wines presented came from very famous wine producing areas in Germany, and of very good quality that will soon be seen in restaurants and bars across South Korea. He went on to say that Riesling wine and sliced Korean pork of samgyeopsal will be presented on June 1, 2012, at 6 p.m. at his residence. 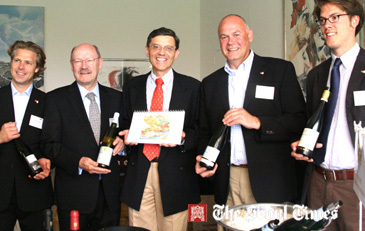 German wines presented at the ceremony included Franken, Rheingau, Mosel, and Pfalz. The German wine exporters expressed gratitude of making South Korea a top destination for their wine products. "I see Korea as a strategic market in Asia and Koreans are noted for their curiosity,” Mr Gunther Rauner said. He is director of Deutsches Weintor's global sales. "We are in South Korea for the first time to educate people about German wine and to locate more importers for our products," said another German wine exporter, Mr Walter Bibo of Schloss Reinhartshausen. "Our wine has had a good response from the Korean public and it is the best wine to match Korean and Asian cuisine," Peter Winter, proprietor of Georg Muller. The wine testing at the German envoy’s residence was part of the "AHK- Business Trip Wine Korea" program hosted by the German chamber to promote German wine. Reactions from Korean importers and other participants are largely positive. "Although Koreans are most familiar with red wine, it is hoped that white wine will soon become a household name in Korea," a participant was quoted as saying. "The German white wine is good with seafood, vegetable, and meat."